OH YE I FORGOT YOU WERE IN THE IRISH SCHOOL OOPPS THIS THING IS IN CAPS LOCK even though im in the St.Seachnaills N.s up the other end of the village any way the other day in school i had to write a story i hope you dont mind i used Alice ,Megan,Lauren,Tilly and Saturn too!i just told my mum your going to be in in Ashbourne in October and she said i could go its great because i just told my little brother and he wants to come too!He said hes gonna bring a pen and notebook.IM gonna bring those too and my camera1Anyway i gotta go and see my grandad it was my brothers communion yesterday so talk soon and the homework went great. Hi…I just met u today and brought u (quite a lot of) my books to sign…you are my fav writer ever…I was the one who asked about seven questions! Hi Roisin. So glad to hear that you’ve grown up to be a reader. Hope I get the chance to meet you in October. Enjoy the rest of the summer. Hi Judi thanks so much for replying. Really looking forward to meet you. Are you signing books or just meeting everyone? I’ll be meeting everyone AND signing books. Hope you can make it. Hi Judi, My name is Tara. 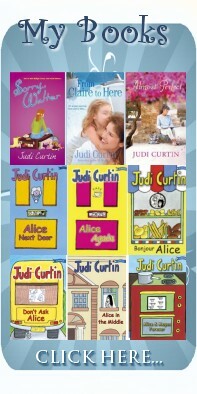 I love your books, I have read all the Alice and Megan books. They are really good and funny. I look forward to reading your new book, I think I will put it on my Santa list. I hope to meet you one day when you are visiting Limerick or Clare bookshops. Thanks so much, Tara.I often do events in limerick and Clare, so hope to meet you before too long. So sorry I missed you, Roisin -maybe next time…..
Hello! I loved your series of Megan and Alice. They are my favourite books to read. I would absolutely love if you wrote more of the Megan and Alice books It would be amazing I also liked the Eva books and my name is Eva! They are also amazing! You are my favourite author. Thanks Flora. I often visit Dublin. Watch this site for news of my next visit.